Here’s a list of blues tunes in every major and minor key (apart from Ab minor), and a Spotify Playlist so you can hear them all. I blogged about this ages ago, and you can see the original post here. It’d be a really good idea to learn them all. Then you’d have a nice repertoire of tunes, 24 ways of playing a blues progression, harmonic variations, melodies, good things to listen to, ideas for constructing solos, and so on. 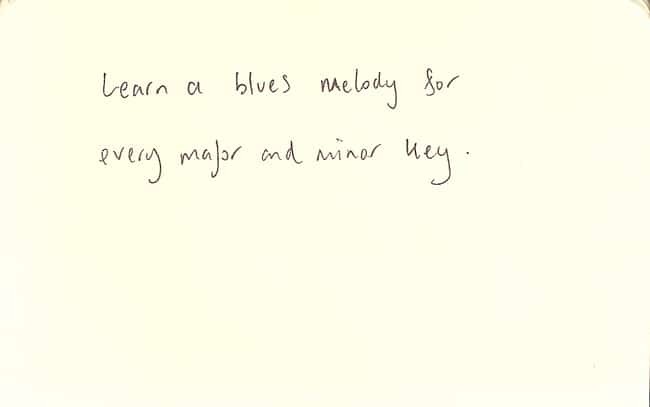 Still haven’t found a blues in Ab minor….